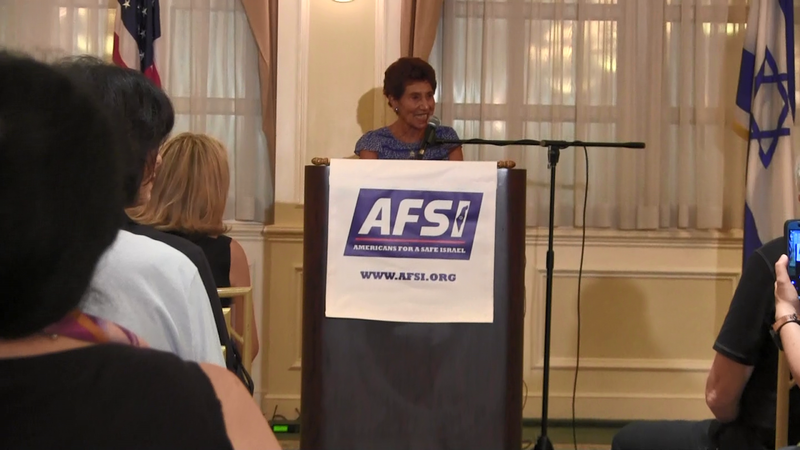 I think Jabotinsky would do exactly what Helen and the wonderful people at AFSI do all the time. I believe that he too would raise his voice in constant opposition to a suicidal two-state solution and would expend his resources and innate talent to support the settlement movement in Israel. No territorial concessions now or ever! I think Jabotinsky would exhort the government of Israel to never pander to the destructive voices of Peace Now, B'Tzelem and the litany of George Soros sponsored NGOs who influence the Israeli court system and have been instrumental in having settlements dismantled by government forces. No speech in these times would be complete without acknowledging our president, Donald J Trump. Did any of us really ever believe that any US president would have the courage to move the US embassy from Tel Aviv to Jerusalem? Did any of us ever believe that a US president would consistently stand up for Israel in the UN simply because Israel represents truth and righteousness in the Middle East? Did anyone in this room ever believe four years ago that a president would be elected who did not harbor a palpable animus towards Israel? If we look back on very recent history, we only see commanders-in-chief wanting to pressure Israel into an agreement that would spell their demise. Yet and still, the Jew is a vigilant character and knows that the political maelstroms that we are immersed in ebb and flow. At any given moment the predicament that we face could change in an instant. I ask all of you here today - clearly you are people who care deeply about their brothers and sisters and the state of Israel - people who have devoted their time to supporting Israel; to paying tribute to the great Jabotinsky and all that he emulated. I ask all of you today to speak out for your people at every turn. Today the Democratic Party has taken a sharp and dangerous turn to the left and it ranks are replete with Israel bashers of all stripes. Today the purported "resistance" who work in concert with the Fake News have attempted to distort our reality. Our younger generations, our millenials are buying into their narrative of lies and gross distortions. Just as Jabotinsky did, it is incumbent on all of us to speak truth to power, to vanquish the discord that our youth find themselves in and to help lead yet another generation to their glorious heritage. And let's do it, with the words of Jabotinsky reverberating in our hearts and minds." Reporter, Aaron Klein ("Big Jerusalem" on Breitbart News), delivers his perspectives looking back on the past 13-years of reporting from Israel. Mr. Klein reflects on the current status of how the 13-year, de-occupied Palestinians have proven the intentions of their desired sovereignty is not co-existence with the Jewish state, but conquering Israel for Islam. (Video below). The applause at the beginning of the video is for AFSI co-founder, Helen Freedman, whom, accompanied by co-director, Judy Freedman Kadish are embarking on a trip to Israel. 13-years ago, they (along with Aaron Klein) traveled to stand alongside Jewish Gazan, Gush Katif communities to witness the final days of Prime Minister Ariel Sharon's "disengagement" evacuation of 9,000 Jewish residents. .